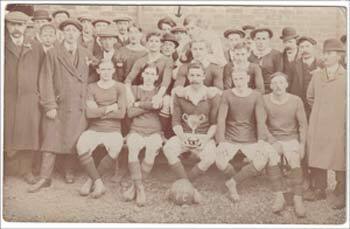 This postcard shows the Woburn Sands Stars football team with the cup they won in 1912 for being the winners of their division of the Second League in Bedfordshire. In actual fact, they had won all their games, except two which they drew. Amongst the games that season, they had beaten Biggleswade 2-1, Newport Pagnell Autos 6-1, Bedford Park Rangers 7-0, Marston Rovers 5-0 and Luton Ivy United 4-1. Although winning this trophy for heading their respective division, they then had to play Harrold for the inter-division cup, on a pitch at Kempston which had an extreme slope and was very hard and bumpy. Although leading 1-0 at half time, in the second half the hill was against them, and the lost 2-1. Whitmee was a dairyman, who had a shop in Wood Street. …but war was just around the corner, and ‘The Woburn Reporter’ records in 1916 that all the current Woburn Sands Stars team had long since signed up and gone to war, and that three had already been killed.